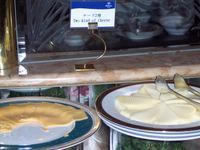 From the breakfast buffet at the Narita Hilton in Japan...can you see the print? But what kinds of cheese are they? Orange and yellow desu. Oishii, nee?